Oooh lalala! 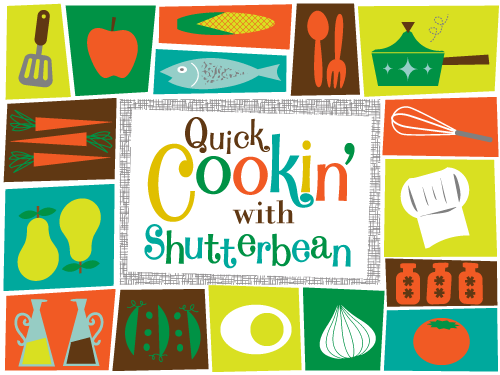 Ring the dinner bell friends, it’s time for Quick Cookin with Tracy of Shutterbean. Tracy is not only an amazing cook, she is a very clever cook! Her meals are not only supremely tasty they are always deliciously simple—perfect for busy folks, whether you have kiddos or not. Hit it, Tracy! Hi friends! Tracy here with another easy peasy dish for you and your family to enjoy. 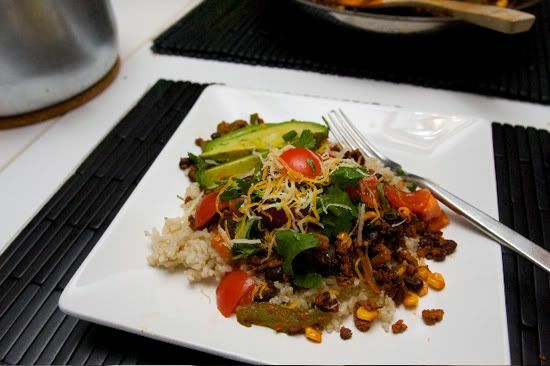 Have you heard of Soyrizo? It’s soy version of chorizo and it’s totally fabulous! It’s got the taste & texture of spicy chorizo, but there’s no meat involved! My husband is a huge fan of the stuff even though he’s a big meat eater. Sometimes I serve it alongside our eggs and toast or I mix it up with breakfast potatoes! 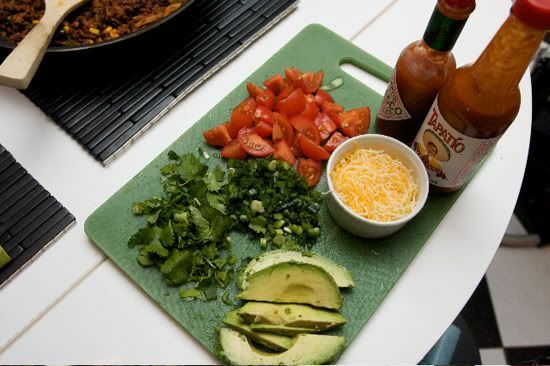 Most of the time I just use it to make this quick Mexican Stir Fry. My boys love it. I’m always trying to find a way to get my son Cooper to eat vegetables, and this dish does a good job of masking some! In this rendition, there’s corn, tomatoes and green peppers. There’s also a dose of protein & fiber from beans & brown rice. The soyrizo has all the spices you need so nothing really needs to be added, making it super easy to make. The leftovers are fantastic. Throw some in a cheesy quesadilla or add it to a burrito or taco! I like to eat what’s leftover the next day with some avocado chunks and a few dashes of hot sauce on top! I like to make a little “toppings” bar so you we all can customize our own plate! 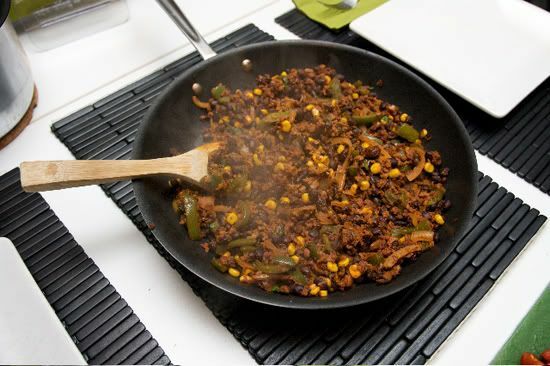 p.s—This is what soyrizo looks like! I usually get mine from Trader Joe’s! p.p.s.— It looks like a long sausage- shaped like a big U. You need to make sure you don’t cook the “skin” as it’s plastic! Just cut off the ends and *squeeze* it out into the skillet. In a deep skillet on medium high heat, add soyrizo & onions. Cook for a few minutes until the onions start becoming translucent. Add in the frozen corn & bell peppers and cook for another 3-5 minutes. Add your black beans and brown rice and heat through. It’s really good if you can almost brown/char some of the soyrizo! It adds a nice texture to it! Serve with you favorite toppings! This recipe is just a base. If you like more corn, add more corn! Not a fan of black beans? Add pinto! Have some leftover sweet potatoes? Throw them in! I must warn you that the soyrizo is on the spicier side. If your children or significant other is sensitive to spice, then you might wanna opt out of this recipe 😉 You could also just add some pureed sweet potatoes to help balance the spice! Fortunately, my son Cooper LOOOVES spicy stuff. He goes totally apey when I make this. He calls it “Spicy Rice!” I guess the apple doesn’t fall from the tree! Thank you so much Tracy for another super yum yum dish. 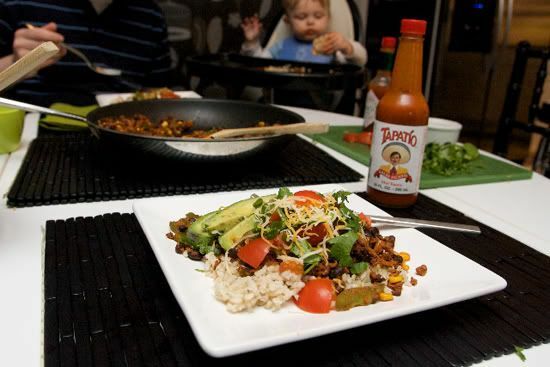 I can vouch for the fact that soyrizo is TASTE-TEE!!! Oh, and that little cutie in the background (aka The Spicy Wonder!) is Tracy’s mega cute boy Cooper. Coop has been Weekly Kiddo before and I think you’ll agree he is adorable. Check him out here. 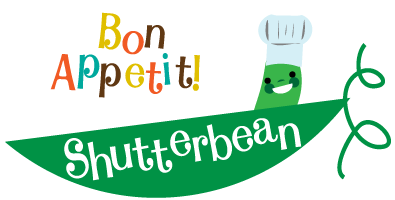 Miss Shutterbean, this looks amazing! And thanks for the sweet potato tip to mellow out the spiciness. I can’t tell you how much I adore these recipes, because mamas need easy to pull together recipes. BTW, love the picture of that handsome little buy in the high chair… Weekly Kiddo, anyone? a) I have been waiting for this recipe all week! Yeah! 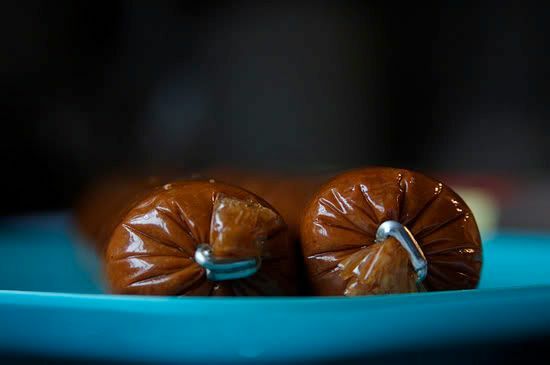 c) um, nice sausage picture? ha! Thank you! That’s actually an old pic of Coop!! He’s been eating the Mexican Stir fry for AGES!! He’s been lucky to be a weekly kiddo! It made my family and friends so proud! Wow, this looks amazing from Tracy – excellent choice for a guest post! I’ve never tried cooking Mexican, this provides great inspiration.. All those photos are great for new people (like myself) lol..
Of course! As soon as I posted the comment, I remembered it. I’m a PURE DORK, Tracy. My complete apologies. How could I forget–he had some seriously cute preppie sassiness. Maybe we just need to do ANOTHER one of him. Hee hee! This sounds fantastic! I’ve always wondered about Soyrizo as I’m vegetarian, but haven’t tried it. Definitely will try this! Soyrizo sounds intriguing! I wish it were available locally to me.